Brimbsy’s Hats | What is ML Reading? It’s only the second week of January, but we’ve read a book I guarantee you will be on our Top Ten Picture Books of 2014. Even though it was published in 2013… on New Year’s Eve. 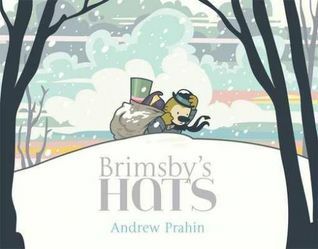 Brimsby’s Hats by Andrew Prahin is a story of friendship. Unlike many picture books celebrating friendship… it’s sweet, not syrupy. The illustrations alone make it a hit. With a unique, muted palette, excellent use of white space and funny details on each page; it’s a true gift. ML first heard this story last night with her friend, Pip. They’ve been friends forever. Unbeknownst to me a little girl was born to a family around the block 12 days before ML. Our neighborhood had a small park with playground equipment perfect for toddlers and preschoolers. Many friendships were formed there. Both children and parents made lasting friendships. It’s where my friendship began with Pip’s mom, Becky. Soon after, ML’s dad and I separated. Then, Becky gave birth to another daughter. Her husband was in Iraq for many months proceeding and following the birth. We joined forces. Communal dinners with baths, jammies and books were the norm. ML and Pip’s first sleepover was the night the heat went out at our house. Putting on shows, climbing our fig tree, digging in the dirt, eating ABC pasta, and making potions filled the girls days together. One day ML and Pip were at Pip’s house. They decided to make a potion. Sneaking the sunscreen, shampoo and lotion into Pip’s room they started stirring up a brew. When Becky checked on the girls she knew they were up to something from the aroma permeating the room. The girls learned a lesson. Potion making is an outside activity. Dirt, water, leaves and berries are the best ingredients to use. These girls are creative and compassionate just like Brimsby. Lonely after his friend moves away… he uses his talents to help the birds. The result – a lovely friendship with a flock of birds. Between the park, playdates, and preschool the girls saw each other most days for several years. Then, we moved and the girls started attending different schools. Now the girls go weeks without seeing each other. However, like Brimsby and his friend who moved away, they pick up exactly where they left off. Quirky, creative, whimsical, delightful and lovely are adjectives I read in reviews of this book. I agree. And they are words which describe ML and Pip to a T.
I’m writing this post at a coffee shop on Hargett Street which opened today. I highly recommend you visit it. As soon as I remember the name, I’ll post it here. The girls are trying out a trapeze class at Cirque de Vol down the street. A perfect activity for two girls whose friendship grew on the monkey bars at the Oakwood Common. This entry was posted in Picture Book and tagged Andrew Prahin, Brimsby's Hats by mlreads. Bookmark the permalink. Can’t wait to check out the new Caldecott winners. Thanks for keeping us moms informed. Glad to do it. Maybe I’ll do some books about “Tiny Houses” for kids soon.